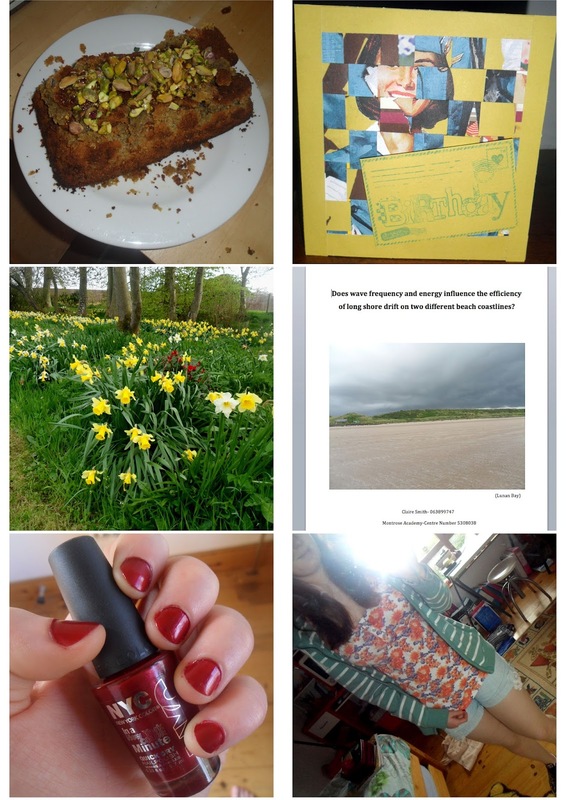 (From top left) My mums birthday cake, My mums birthday card, The daffodils in our garden, My finished geography project, Painted my nails, Shorts are out again! Well my first week of study leave has passed with very little studying taking place. I did however spend two whole days in the geography department at school finishing my long shore drift study. These two days were quite stressful though and I didn't feel like doing much afterwards. I will study much better next week. We went to the Chinese with family on Friday which was really nice. I then went out to an 18th at night which was a pretty crazy evening. Too much was drunk as normal but sadly I didn't take many pictures with always makes me sad because I love to look back at them however dreadful they are. Today it is my dear mums birthday- I have made her a cake for tea tonight and also a handmade card. She is really hard to buy presents for so I didn't get her anything. I don't like to buy people rubbish presents so I would rather wait. The fact I might not have money for the summer is beginning to scare me. I like to go out with friends and shop so I really need a job or a way to make money. Will have to start thinking. Hope you have all had a good weekend.